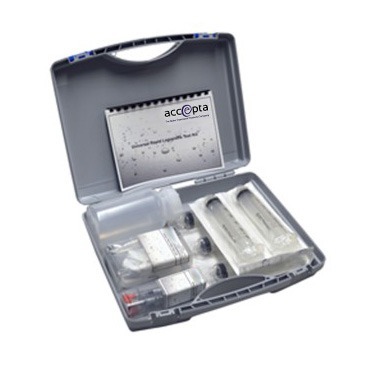 Accepta’s high quality microbiological dipslides / contact slides offer a quick and easy means of monitoring aerobic bacteria in liquids and on surfaces, making them ideal for engineers, water treatment professionals; and building services and facilities management specialists. 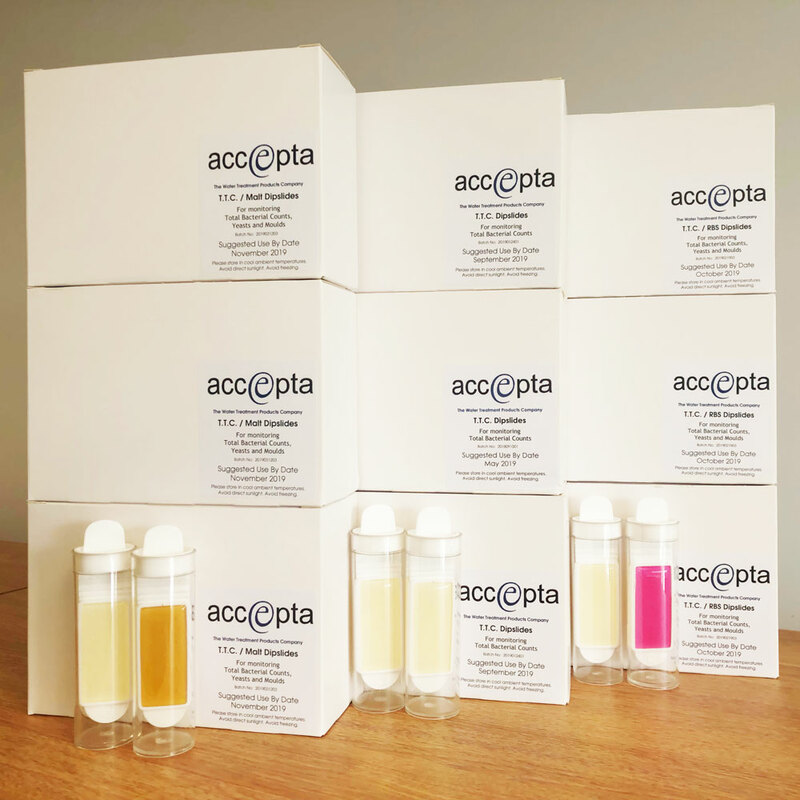 Accepta’s dipslides / contact slides are manufactured to the highest quality standards and are used to measure the levels of aerobic bacteria found in water systems and on surfaces. 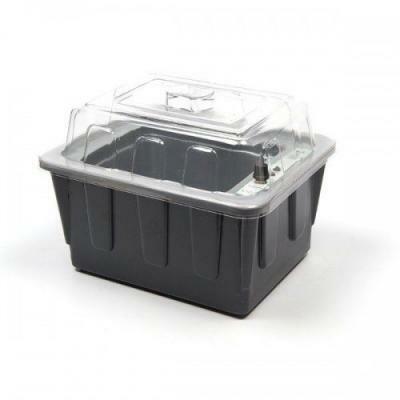 Accepta’s dip slides/contact slides are supplied in boxes of 10 and come complete with full instructions. A colour chart is also supplied with each box which is used to determine the concentration of aerobic bacteria.The UK Health & Safety Executives Approved Code of Practice (ACoP) L8 and HSG 274 documents dealing with the control of legionella bacteria in water systems the HSE recommends the use of dipslides to monitor the general activity of aerobic bacteria in cooling towers. 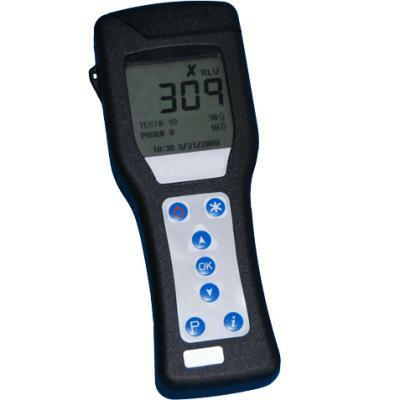 All dipslides should be incubated at a carefully controlled temperature of 30oC for 48 hours to obtain an accurate result.Since early 2001 the weekly monitoring of bacteria levels in cooling water has been recommended by many legislators and professional organisations as a visual performance indicator to both system cleanliness and treatment regime. 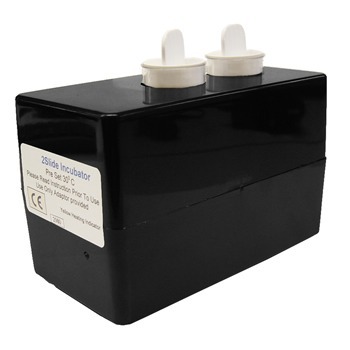 Such monitoring allows the user to determine how effective a chemical or biocide treatment product is in the particular application and a trend can be quickly established, identifying changes and taking quick remedial action where required. 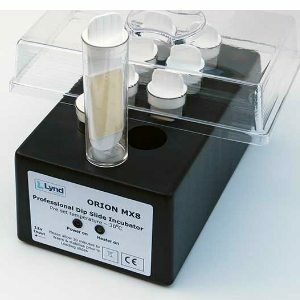 It should be noted from the outset that dipslides alone do not detect Legionella as a select micro-organism, however, it is generally accepted that overall bacteria levels in excess of 104 are considered able to support Legionella and are considered to present a serious risk to health and safety. Accepta’s dip slides comprise a plastic paddle with culture media on each side. Each paddle sits within a clear plastic tube which helps to protect the paddles and to keep the culture media both moist and sterile until required for testing purposes. 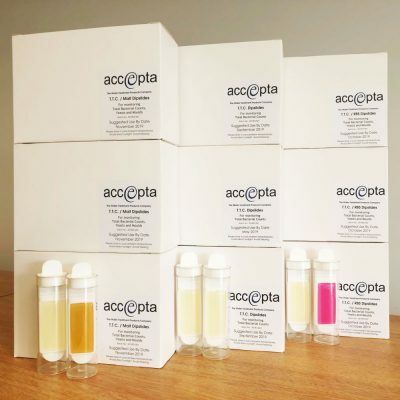 Accepta’s slides are based on a standard nutrient agar with a red dye supplement added during production, this has the advantage of showing any viable colonies as red dots, easily identified and compared against the comparison chart printed on each box of dipslides. IMPORTANT – Monitoring is not a substitute for a treatment regime, you should seek the advice of a professional water treatment or environmental company who will supply a risk assessment together with the required treatment system. The advantage of your weekly monitoring program is you can see how well the system is performing and identify any problems in house and in-between visits, together with peace of mind – remember counts should never exceed 103 at any time! Note – All Accepta dipslides can be own labelled, please contact us for further details. If you require additional information or specialist technical support concerning our dipslides please contact Accepta’s technical support team.